The Palestinian Legislative Council is to publish a detailed report exposing Palestinian Authority (PA) President Mahmoud Abbas as being corrupt ahead of taking steps to oust him, Quds Pressrevealed yesterday. Sources told the news site that the report was in its final stages and it exposes how Abbas has been using public funds since he took office in 2005. Precise information would be included in the publication. It also said that the report depended on information mainly taken from official PA documents and correspondences and this would be an opportunity for thousands of Palestinians to discover details about how PA money has been spent over the past 12 years. Abbas froze the Palestinian Parliament in 2007 after Hamas won an overall majority during the elections. 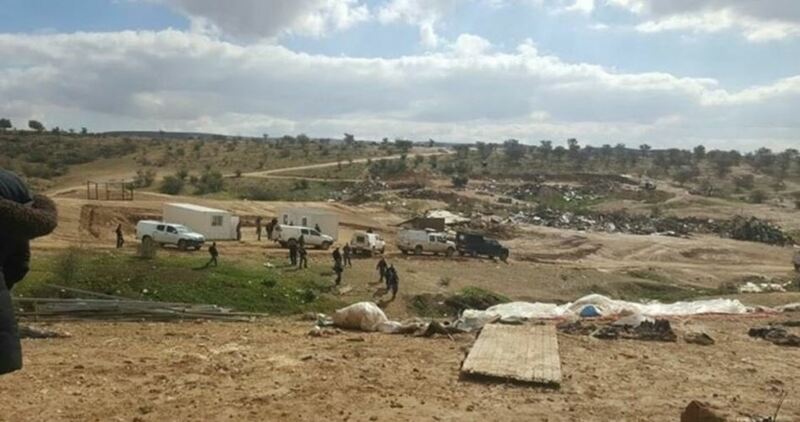 BETHLEHEM (Ma’an) — Israeli forces demolished the Bedouin village of al-Araqib in the Negev region of southern Israel for the 116th time since 2010 on Tuesday morning, and for the eighth time this year, according to Palestinian Authority (PA)-owned Wafa news agency. Wafa quoted witnesses as saying that officials from the Israel Land Authority (ILA), accompanied by Israeli police and bulldozers, raided the village and demolished all the tin homes in the area, which were built by the village’s residents following the most recent demolition in early July. The classification of their villages as “unrecognized” prevents Bedouins from developing or expanding their communities, while Israeli authorities have also refused to connect unrecognized Bedouin villages to the national water and electricity grids, and have excluded the communities from access to health and educational services. The unrecognized Bedouin villages were established in the Negev soon after the 1948 Arab-Israeli war following the creation of the state of Israel. Many of the Bedouins were forcibly transferred to the village sites during the 17-year period when Palestinians inside Israel were governed under Israeli military law, which ended shortly before Israel’s military takeover of Gaza and the West Bank, including East Jerusalem, in 1967. Neither Fatah nor Hamas have been of much relevance to the mass protests staged around the Al-Aqsa Mosque compound in Jerusalem. Neither have American pressure, half-hearted European “concern about the situation” or cliche Arab declarations made one iota of difference. United Nations officials warned of the grim scenarios of escalation, but their statements were mere words. The spontaneous mass movement in Jerusalem, which eventually defeated Israeli plans to change the status of Al-Aqsa, was purely a people’s movement. Despite the hefty price of several dead and hundreds wounded, it challenged both the Israeli government and the quisling Palestinian leadership. Israel shut down the Al-Aqsa compound on July 14, following a shootout between three armed Palestinians and Israeli occupation officers. The compound was reopened a few days later, but Palestinian worshipers refused to enter, as massive security installation, gates, cameras and metal detectors were installed. The people of Jerusalem immediately understood the implication of the Israeli action. In the name of added security measures, the Israeli government was exploiting the situation to change the status of Al-Aqsa, as part of its efforts to further isolate Palestinians and Judaize the illegally occupied city. The Israeli army occupied Palestinian East Jerusalem in 1967, annexing it in 1981 in defiance of international law and despite strong UN objection. For 50 years, Jerusalem has endured daily battles. The Israelis fought to expand their influence in the city, increase the number of illegal Jewish settlers and cut off Jerusalem from the rest of the Palestinian territories, while Palestinians, Muslim and Christians alike, fought back. The Al-Aqsa compound — also known as Haram Al-Sharif, or the Noble Sanctuary — is the most symbolic element in the fight. It is a microcosm of the fate of the occupied city, in fact the fate of the entire Palestinian land. The compound has been administered by Islamic Waqf, through an Israeli-Jordanian understanding. Many Israeli politicians in the Likud Party and the Netanyahu-led right-wing government coalition have tried to change this. Palestinians understand that the fate of their mosque and the future of their city are tightly linked. For them, if Al-Aqsa is lost, then Jerusalem is truly conquered. This fight, between Palestinian worshipers and the Israeli army happens every single day, usually escalating on Friday. It is on this holy day for Muslims that tens of thousands of faithful flock to Al-Aqsa to pray, oftentimes to be met by new military gates and army regulations. Young Palestinians, in particular, have been blocked from reaching Al-Aqsa, also in the name of security. But the struggle for Jerusalem can rarely be expressed in numbers, death toll and televised reports. It is the ordinary Palestinians’ constant fight for space, for identity and to preserve the sanctity of their holy land. In the last two years, the fight escalated further as Israel began expanding its illegal settlements in East Jerusalem and right-wing parties issued a series of laws targeting Palestinians in the city. One such law is the “Call to prayer” law, aimed at preventing mosques from making the call for prayers at dawn, as has been the practice for a millennium. Palestinian youth, many born after the failed Oslo Accords, are fed up as the Israeli military controls every aspect of their lives and their corrupt leadership grows more irrelevant and self-serving. This frustration has been expressed in numerous ways: in non-violent resistance, new political ideas, in art, music, on social media, but also through individual acts of violent resistance. Since the most recent Al-Quds Intifada — Jerusalem uprising — started in October 2015, “some 285 Palestinians have died in alleged attacks, protests and (Israeli) army raids,” Farah Najjar and Zena Tahhan reported. About 47 Israelis were killed in that same period. But the Intifada was somehow contained and managed. Certainly, human rights groups protested many of the army killings of Palestinians as unnecessary or unprovoked, but little has changed on the ground. The Palestinian Authority has continued to operate almost entirely independent from the violent reality faced by its people on a daily basis. The shootout of July 14 could have registered as yet another violent episode of many that have been reported in Jerusalem in recent months. Following such events, the Israeli official discourse ignores the military occupation entirely and focuses instead on Israel’s security problem caused by “Palestinian terror.” Politicians then, swoop in with new laws, proposals and radical ideas to exploit a tragic situation and remold the status quo. Considering the numerous odds faced by Palestinians, every rational political analysis would have rightly concluded that Palestinians were losing this battle as well. With the United States fully backing Israeli measures and the international community growing distant and disinterested, the people of Jerusalem could not stand a chance. But such understanding of conflict, however logical, often proves terribly wrong, since it casually overlooks the people. In this latest confrontation, Palestinians of Jerusalem won, presenting an impressive model of mobilization and popular solidarity for all Palestinians. The Israeli army removed the barricades and the metal detectors, pushing Israel to the brink of a political crisis involving angry politicians, the army and internal intelligence, the Shin Bet. The people’s victory was a massive embarrassment for Mahmoud Abbas, the president of the Palestinian Authority in Ramallah. He tried to “piggyback off the protests” but failed, the Atlantic reported. Other factions, too, moved quickly to mobilize on the people’s victory, but their efforts have appeared staged and insincere. “Today is a joyful day, full of celebration and sorrow at the same time — sorrow for the people who lost their lives and were injured,” a protester told journalists, as thousands stormed the gates of Jerusalem armed with their prayer rugs, flags and voices hoarse from chanting for nearly two weeks. “This is very much a grassroots movement — this isn’t led by Hamas or Fatah, the traditional political leaders of the Palestinians,” journalist Imran Khan reported from outside the compound. This grassroot movement was made of thousands of women, men and children. They included Zeina Amro, who cooked daily for those who held steadfast outside the compound, was shot by a rubber bullet in the head, yet returned to urge the men to stand their ground the following day. It also includes the child Yousif Skafi, whose chores included splashing water over people as they sat endless hours under the unforgiving sun, refusing to move. It also includes many Palestinian Christians who came to pray with their Muslim brethren. Conveying the scene from Jerusalem, television news footage and newspaper photos showed massive crowds of people, standing, sitting, praying or running in disarray among bullets, sound bombs and gas canisters. But the crowds are made up of individuals, the likes of Zeina, Yousif and many more, all driven by their insistence to face injustice with their bare chests in an inspiring display of human tenacity. Of course, more violence will follow, as the Israeli occupation is enriched and relentless, but ordinary Palestinians will not quit the fight. They have held resolute for nearly 70 years. Rational political analysis cannot possibly fathom how a nation undergoing numerous odds can still mobilize against an army, and win. But the power of the people often exceeds what is seemingly rational. 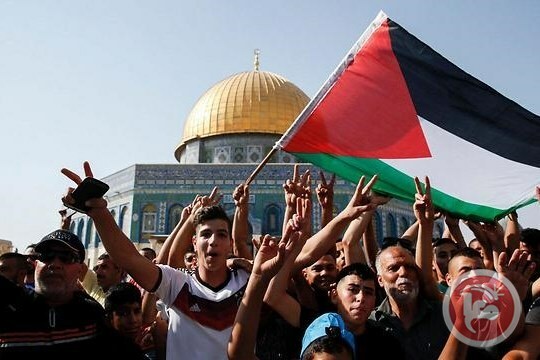 Almost leaderless, Palestinians remain a strong nation, united by an identity that is predicated on the pillars of human rights, resistance and steadfastness. BETHLEHEM (Ma’an) — Palestinian officials were evasive on Tuesday regarding Israeli media reports that Palestine Liberation Organization (PLO) Chief Negotiator Saeb Erekat’s health had seriously deteriorated. Israeli news outlet Ynet reported on Tuesday that 62-year-old Erekat was diagnosed with pulmonary fibrosis more than a year ago, and was currently on a waiting list for a lung transplant in Israel or the United States. Without citing its sources, Ynet said that Erekat’s position in the PLO would be taken over by Palestinian Authority general intelligence chief Majid Faraj should Erekat’s health further deteriorate. 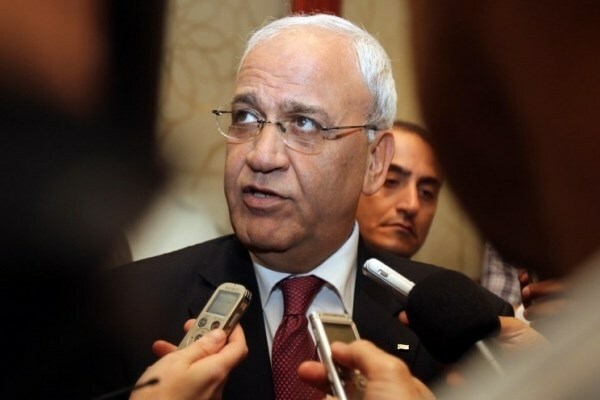 The PLO has not issued any official statements on Erekat’s health or eventual replacement. Xavier Abu Eid, Erekat’s spokesman, told Ma’an on Tuesday by telephone that he “can’t confirm” that Faraj was replacing Erekat. Abu Eid denied that Erekat had stepped down from his role, telling Ma’an that the senior Palestinian official was in the office on Tuesday. Wafa did not issue reports on Erekat’s health in the past few days, although it published several written statements from his office on illegal Israeli settlement expansion. The health of 82-year-old head of state has been a regular topic of conjecture over the years, as pundits have wondered who might replace Abbas, who has been in power since 2005, should he pass away. Al-Shabaka is an independent non-profit organization whose mission is to educate and foster public debate on Palestinian human rights and self-determination within the framework of international law. This is the second of a three-part analysis on water rights in the occupied Palestinian territory, written by Al-Shabaka policy member Muna Dajani. The first part was published on Ma’an News on Monday, and the third and final section will be published on Wednesday. The full report can be read here. The international donor community, in its eagerness to establish evidence of the usefulness of its million-dollar investments, exacerbates this system of water inequality between Israel and Palestine. Though donors’ approach has been to increase water availability and protect the health of people and the environment, under occupation this is achieved through acquiescence to the status quo. Aid is not supposed to be a long-term intervention, but rather should provide support to local actors and communities so they can develop sustainable resource reclamation and ownership. Considering the decades-long interventions and millions of dollars channeled to the occupied Palestinian territory (OPT) in the water sector, the failure of donor communities to enhance the living conditions of Palestinians demonstrates how aid has harmed the recognition of Palestinian rights. Since the 1990s, international donor agencies have increased investment in the Palestinian water sector by constructing small- and large-scale wastewater treatment plants, water networks, sewage lines, and even a desalination plant in Gaza. Most of these projects are conducted under the terms of the Oslo Accords, which dictate that the Joint Water Committee plans the projects before any money is given to the PA. As such, the development of the water sector outside the narrow scope of Oslo is restricted. International investments have generally focused on the construction of wastewater treatment plants in the West Bank, with increasing donor interest in the development of six major plants in Nablus West, Jenin, Jericho, Al-Bireh, Ramallah, and Tulkarem. Yet a significant number of these projects do not come to fruition. The Salfit wastewater treatment plant, for example, secured funding in the 1990s but has never been operational. The JWC has taken the project through a labyrinth of bureaucracy, from changing its approved location to making its operation conditional on linking it to the Ariel settlement, one of the largest settlement blocs in the West Bank that channels its untreated wastewater into Palestinian villages nearby. Such convictions of the need for wastewater infrastructure to replace a “limited” resource is echoed by many PA officials, donor agencies, and civil society organizations. While wastewater treatment is necessary, its framing as an additional water source for agriculture strengthens the notion of finding alternative means of achieving water rights in Palestine. In other words, the focus on the potential of wastewater rather than Palestinians’ lack of water rights couches water as a natural crisis that needs a technological solution — rather than a man-made problem that deliberately deprives Palestinians of a vital resource. 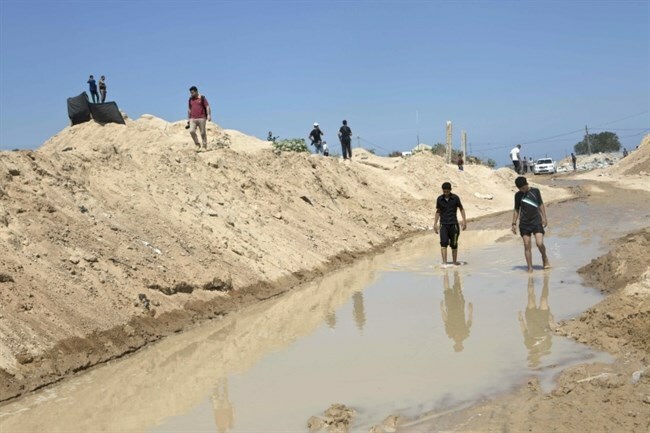 As for the Gaza Strip, over the last decade news articles, reports, and international campaigns have described its water scarcity as “catastrophic,” “alarming,” and constituting a “humanitarian crisis.” Indeed, the population is forced to make do with a main water source — a coastal aquifer — that is 96 percent unfit for human consumption. This is due to decades of over-extraction, sewage contamination, and seawater intrusion. Israel’s blockade and offensives have exponentially exacerbated this problem and solidified water de-development, in large part due to the destruction of vital wastewater treatment plants, reservoirs, and power stations. Similar to the wastewater treatment plants in the West Bank, Gaza’s desalination plant, though constructed, is not fully operational. UNICEF, after decades of raising funds from the EU and others, inaugurated the plant in January 2017. However, by the end of February the plant was only running on a partial basis, powered by emergency fuel. Desalination plants also require continuous maintenance and spare parts and materials, which is now facilitated under the Gaza Reconstruction Mechanism. Designed to “facilitate urgently needed reconstruction,” the Mechanism made the blockade its starting point, a move that Oxfam criticized as normalizing the siege and “giving the appearance of legitimizing an extensive control regime.” Moreover, Oxfam reiterated the danger of separating economic and technological solutions from political conditions. When Palestinian and international policymakers flag desalination as the only solution to Gaza’s water situation, this shores up the narrative that technological advancement saves the day, without addressing the underlying political realities and restrictions on the ground. It also exemplifies donors’ naive approach to water in Gaza and the West Bank. Essentially, these projects fail to challenge — and thus, even unwittingly, underwrite — Israel’s international law violations, namely its continued occupation and expropriation of Palestinian land and natural resources. Moreover, the main donors, namely the EU, the UK, and the US, not only fund problematic projects, but actively promote Israeli technology and scientific advancement while ignoring the potential for Palestinian water research. Five Palestinian residents of occupied East Jerusalem were indicted by an Israeli court on charges of “incitement” on social media, Israeli news website Ynet reported on Monday, according to Ma’an. Ynet said that the five Palestinians — identified as Muhammad Mahimar, 19, from Anata, Sufian Mahmoud, 26, from Issawiya, Muhammad Samasana, 23, from Shufat refugee camp, an unnamed 17-year-old, and another unidentified Palestinian — were indicted by a Jerusalem magistrate court for “calling for terror attacks to be carried out against Israel,” and for Facebook posts allegedly supporting a deadly shooting attack at the Al-Aqsa Mosque on July 14. Mahimar was also reportedly indicted for several posts he uploaded in 2014 on his Facebook page allegedly calling for “violent and terror activities against Israeli civilians and security forces,” and for praising and supporting the Hamas movement, which Israel considers a terrorist organization. 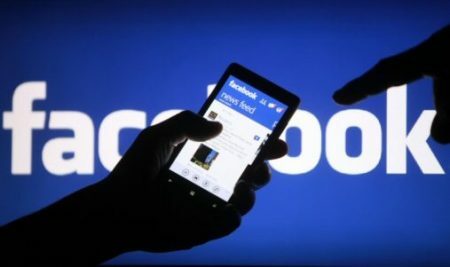 Mahmoud and Samasana were also indicted for uploading posts “calling for violence and terror against Israelis and showing solidarity with terror groups,” Ynet reported, without specifying the content of the posts. Israeli news daily Haaretz reported, in April, that Israeli forces detained at least 400 Palestinians in less than a year over social media activity, and that 400 others were detained for the same reason by the Palestinian Authority, through its widely condemned policy of security coordination with Israel. As of January, only 200 Palestinians were had faced trial for such charges, according the Arab Center for Social Media Advancement 7amleh. A more recent report by Haaretz revealed how Israel has been monitoring social media profiles and subsequently making arrests when “the kid doesn’t know that he is a terrorist yet,” as one Israeli army officer put it. By contrast, a report released by 7amleh documented that slanderous, provocative, and threatening posts made by Israelis against Arabs and Palestinians more than doubled in 2016, reaching 675,000 posts made by 60,000 Hebrew-speaking Facebook users — without a single case being opened against an Israeli. The Israeli district court in Occupied Jerusalem on Monday confirmed the validity of three real estate deals struck between officials from the Greek Orthodox Church and overseas straw buyers that acted secretly on behalf of an Israeli right-wing settler group. The leased buildings are located in a sensitive Palestinian-populated area of the Old City of Jerusalem. The judge said the contracts had been signed in 2004 by those authorized by the Patriarchate and the plaintiffs, and thus ordered the Church to pay 30,000 shekels to Ateret Cohanim group in legal costs. 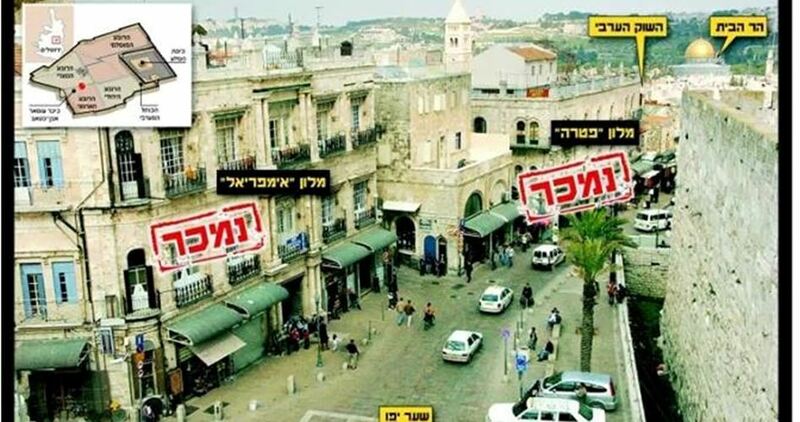 The judgment will bring more unwelcome attention to the Patriarchate, which is already under fire for a series of real estate sales in west Jerusalem, according to Israeli newspapers. The 2004 agreements were to lease buildings, not to sell them, but they are for 99 years, renewable for another 99 years, which essentially puts them into the settlers’ hands for good in one of the most visible positions in the Old City, between the Jaffa Gate (Bab al-Khalil) and the Old City market. The agreements were so appalling and devastating to the Palestinians because behind them stood Ateret Cohanim, which works to acquire property to establish a Jewish majority in the Old City and in Arab neighborhoods of east Jerusalem. The first lease was signed in August 2004 between the Patriarchate and Richards Marketing Corporation for the transfer of the New Imperial Hotel at a cost of $1.25 million. The second, also signed in August 2004, was reached with Berisford Investments Ltd. for the lease on the Petra Hotel, at a cost of $500,000. A third deal was signed in October 2004 by Gallow Global Ltd. to lease an Old City property and grounds in Muazmia Street 18 for $55,000. Nearly six months after Israel’s demolition campaign in the Negev village of Umm Hiran and the resultant events there, the Israeli occupation authority (IOA) resumed its plan to build a settlement called Hiran for Jewish settlers in its place. The Israeli ministry of housing said the purpose of establishing the settlement is to prevent the Palestinian Bedouin communities from controlling the Negev land. The settlement will be built on a vast tract of land in the northeast of the Negev desert, including the land of the village of Umm al-Hiran. Umm al-Hiran is one of a large number of unrecognized Bedouin villages, which are exposed to systematic demolition campaigns in the Negev. Raqqa provincial council on Sunday announced its rejection of the inclusion of the town of Tal Abyad into the Alfurat region in the new administrative divisions announced on Thursday by the terrorist militias of the Democratic Union Party (PYD) in the areas they control in northern and northeastern Syria. The PYD militias decided to divide the areas of the self-styled so-called “Self-Administration” into three administrative provinces after delineating new borders and giving new names to the three provinces. The PYD ratified on Thursday the decision whereby the areas they occupy in north and northeastern Syria were divided to the provinces of Aljazira, Alfurat, and Afrin. “Raqqa provincial council totally rejects this move,” said Saad Shawish, head of the provincial council in Raqqa. He pointed out that the council will protest the PYD move to the international anti-ISIS coalition and the United Nations. Shawish added that people of Raqqa will resort to arms to defend their areas should diplomatic efforts fail. Shawish underscored that the people of Raqqa reject these divisions as the Kurds comprise no more than 15 percent of the total population of the province. Noting that the PYD are imposing their control by the force of arms, Shawish said that the new administrative divisions imposed by the so-called “Self-Administration” followed in the footsteps of the ISIS extremist group which previously re-divided the areas under its control to include towns and villages from outside Syria to the provinces it announced. The so-called “Self-administration” does not consider the local population of Raqqa as “partners in the homeland,” but treat them on a racial basis, Shawish said. He cited the PYD militias’ seizure of property and the forced recruitment of the youth of the province. Forces of the international anti-ISIS coalition made a “big mistake” by depending on the “Self-Administration” in the region as they substituted the religious extremism of ISIS with ethnic extremism, Shawish said referring to the terrorist PYD militias.